1st Place – United Arab Emirates W 3 L 0 T 0. Red and White. 2nd Place – Greece W 2 L 1 T 0. White and Blue. I really like the blue jerseys. 3rd Place – Mongolia W 1 L 2 T o. White and Blue. 4th Place – Georgia W 0 L 3 T 0. White and Red. So much possibility to have something cool based on their flag, but they played it safe. 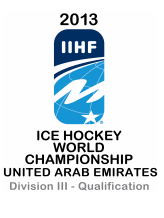 UAE and Greece qualified to play on the Division III Championships from this tournament.